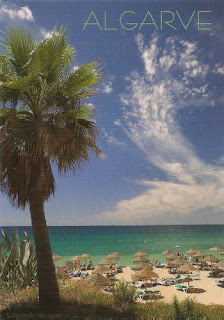 Postcard PT-257988 from Portugal shows a beach scene in the Algarve, the southernmost region of continental Portugal. Known for its sunny Mediterranean climate and its beach and golf resorts, it is the most popular tourist destination in Portugal in the summer. It has half a million regular residents, with visitors and seasonal residents adding to another million during the peak holiday season. The Algarve receives near 10 million visitors annually, including 7 millions from overseas. Today is Portugal Day. To recognize the contributions of Portuguese-American community in California, the State Senate adopted a resolution, declaring June 10th as “Portugal Day” in the state.